Blackpool earned a third successive win in League One and ended in-form Peterborough United's seven-game unbeaten run in all competitions. Mark Cullen scored inside two minutes, turning in the rebound after Ben Alnwick pushed his penalty onto the post following a foul on Elliot Lee. Brad Potts rounded Alnwick to double the lead after 30 minutes. 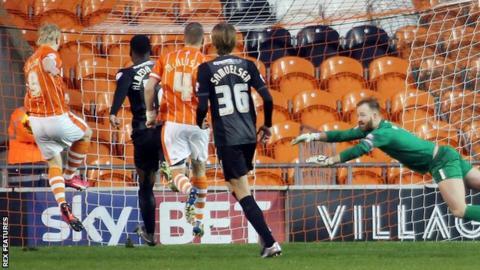 Michael Bostwick twice shot wide for Posh after half-time as Blackpool kept a third clean sheet in a row. "We didn't start the best, that's for sure, and you don't want to come to anywhere and give them the boost and yourselves the uphill battle. "Their two centre-halves were inspired, they defended their goal with real aggression, real determination. "Despite our best efforts, and there were a lot of forward efforts in that second half, they just showed that little bit more desire to keep a clean sheet than we did to put the ball in the net." Match ends, Blackpool 2, Peterborough United 0. Second Half ends, Blackpool 2, Peterborough United 0. Corner, Peterborough United. Conceded by Jim McAlister. Corner, Peterborough United. Conceded by Dean Lyness. Attempt saved. Erhun Oztumer (Peterborough United) right footed shot from outside the box is saved in the top left corner. Corner, Peterborough United. Conceded by Tom Aldred. Substitution, Blackpool. Emmerson Boyce replaces Martin Paterson because of an injury. Attempt missed. Chris Forrester (Peterborough United) right footed shot from outside the box is close, but misses to the left. Corner, Blackpool. Conceded by Chris Forrester. Attempt missed. Jon Taylor (Peterborough United) right footed shot from outside the box is close, but misses the top left corner. Erhun Oztumer (Peterborough United) wins a free kick on the right wing. Ricardo Santos (Peterborough United) wins a free kick in the attacking half. Foul by Andy Little (Blackpool). Ricardo Santos (Peterborough United) is shown the yellow card for a bad foul. Martin Paterson (Blackpool) wins a free kick in the defensive half. Attempt missed. Martin Paterson (Blackpool) header from the left side of the six yard box is close, but misses to the left. Corner, Blackpool. Conceded by Conor Washington. Corner, Blackpool. Conceded by Michael Bostwick. Attempt missed. Chris Forrester (Peterborough United) header from a difficult angle on the right is close, but misses to the left. Corner, Peterborough United. Conceded by Clark Robertson. Substitution, Peterborough United. Souleymane Coulibaly replaces Martin Samuelsen. Attempt missed. Michael Bostwick (Peterborough United) right footed shot from outside the box is close, but misses to the left. Substitution, Blackpool. Martin Paterson replaces Elliot Lee. Substitution, Blackpool. Andy Little replaces Mark Cullen. Attempt missed. Andrew Fox (Peterborough United) left footed shot from the centre of the box is close, but misses to the left. Attempt saved. Jon Taylor (Peterborough United) right footed shot from outside the box is saved in the bottom right corner. Elliot Lee (Blackpool) wins a free kick in the defensive half.